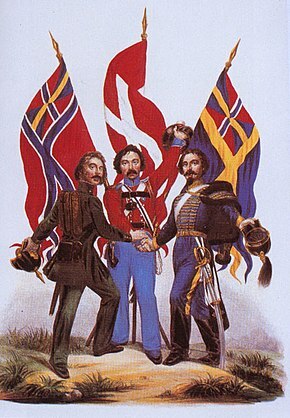 The mid-19th century Scandinavism political movement led to the modern use of the term Scandinavia. In the social sciences, a political movement is a social group that operates together to obtain a political goal, on a local, regional, national, or international scope. Political movements develop, coordinate, promulgate, revise, amend, interpret, and produce materials that are intended to address the goals of the base of the movement. A social movement in the area of politics can be organized around a single issue or set of issues, or around a set of shared concerns of a social group. In a political party, a political organization seeks to influence, or control, government policy, usually by nominating their candidates and seating candidates in politics and governmental offices. Additionally, parties participate in electoral campaigns and educational outreach or protest actions aiming to convince citizens or governments to take action on the issues and concerns which are the focus of the movement. Parties often espouse an ideology, expressed in a party program, bolstered by a written platform with specific goals, forming a [coalition] among disparate interests. Some political movements have aimed to change government policy, such as the anti-war movement, the ecology movement, and the anti-globalization movement. Many have aimed to establish or broaden the rights of subordinate groups, such as abolitionism, the women's suffrage movement, the civil rights movement, feminism, gay rights movement, the disability rights movement, or the inclusive human rights movement. Some have represented class interests, such as the Labour movement, socialism, and communism, others have expressed national aspirations, such as anticolonialist movements, Ratana, Zionism, and Sinn Féin. Political movements can also involve struggles to decentralize or centralize state control, as in anarchism, fascism, and Nazism. With globalization, global citizens movements may have emerged. Movements may be named by outsiders, as with the levellers political movement in 17th century England was so named as a term of disparagement. Yet admirers of the movement and its aims later came to use the term, and it is the term by which they are known to history. Harrison, Kevin; Boyd, Tony (2003). Understanding Political Ideas and Movements: a Guide for A2 Politics Students. Manchester University Press. Opp, Karl-Dieter (2009). Theories of Political Protest and Social Movements: A Multidisciplinary Introduction, Critique, and Synthesis. Routledge. Snow, David; Della Porta, Donatella; Klandemans, Bert; McAdam, Doug. The Wiley-Blackwell Encyclopedia of Social and Political Movements. John Wiley. ^ Mc Donald, Neil (1963). The Study of Political Parties. New York. ^ Plant, David (2005-12-14). "The Levellers". British Civil Wars and Commonwealth website. Retrieved 2013-06-05.